More accidents are being reported by the powered access industry through IPAF’s voluntary programme. Preliminary results from the federation’s accident database reveal there were 53 fatalities world-wide involving aerial work platforms in 2013. Causes of the fatalities included: Overturning (16), falls from height (13), entrapment (10), electrocution (7), impact with an aerial lift (4) and falling objects (2). In one case, the cause of the fatality was not known. Almost half of the number of reported fatalities (26 or 49 %) involved self propelled boom lifts (IPAF category 3b). Fourteen fatalities (26 %) involved self propelled scissor/vertical lifts (category 3a) and 11 or 21 % involved static booms (category 1b). In two cases the type of machine involved was not known. The majority of accidents (30, or 57 %) of the fatalities occurred in the USA, which according to IPAF Powered Access Rental Market Reports 2013 has 54 % of the world’s rental fleet. There were three fatalities reported in Germany, Spain and the UK, two fatalities each in Belgium, Canada, France and the Netherlands, and one each in Armenia, Australia, Ireland, Malaysia, Norway and in the Middle East. 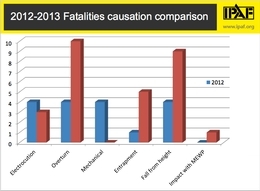 IPAF first launched its accident reporting project in January 2012. In its first year 32 fatalities worldwide involving work platforms were reported. IPAF technical officer Chris Wraith stressed that the accident project is still at an early stage and cautioned against direct comparisons in its second year.